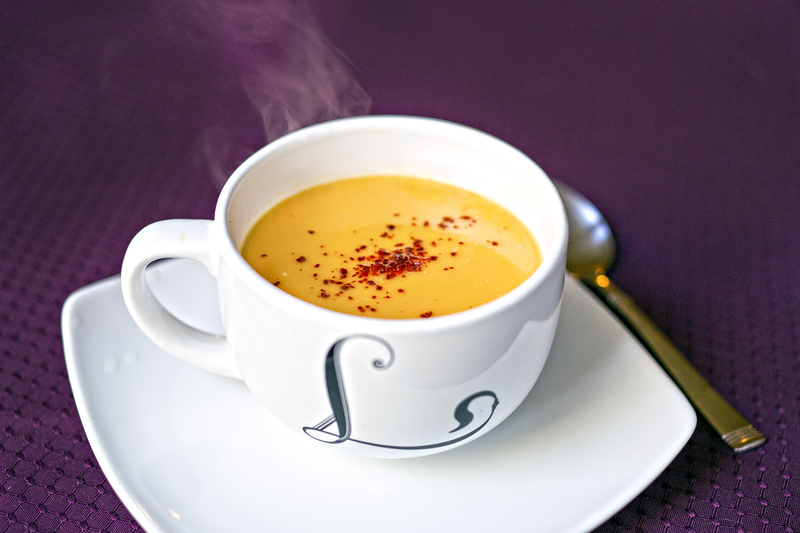 Good hot or cold, this soup is perfect for Texas fall weather that can’t make up its mind. Yum! I want it now! I love a Vichyssoise, the classic French potato-leek soup that’s served cold. However, white potatoes have gotten a bit of a bad rep lately for being too starchy and not “nutrient dense.” Enter the sweet potato to save the day. I thought sweet potato + sweet leeks must be delicious. While it does throw off the intention of a regular Vichyssoise (which is decidedly NOT sweet on sweet), it does create a wonderful soup nonetheless. The coconut milk makes pretty swirls when you put it in. This is an awesome recipe to have on hand during the fall if you live in the south. While the rest of the country starts to bundle up, eat stew, and hack away squash like there’s no tomorrow, it’s a little hard for us in the south to get behind the warm comfort food when it’s still in the mid to high 80’s outside. This recipe follows the rest of the country using fall’s favorite veggie (the sweet potato), but it’s actually delicious served hot, cold or just room temp. Make a big batch, and eat it cold if it’s still hot outside, or warm it up when that cold front finally passes. You could also very easily substitute the fall squashes (butternut, acorn, kobacha, even pumpkin would work) for the sweet potatoes. I use Aleppo pepper, which are not-spicy pepper flakes that are bright and citrusy. If you can’t find it, a pinch of cayenne or regular red pepper flakes will work just fine, just don’t over do it. You want the marriage between the leeks and the sweet potato to sing in harmony with the lemon. On that note, don’t throw the whole can of coconut milk in there. Too much will throw off the balance of everything, in addition to adding unnecessary fat. Just use one cup and save the rest for your morning smoothie. Heat the oil in a soup pot over medium heat. Add the sliced leeks, a little salt, and sauté until they are soft and have reduced in bulk by about half, about 10 minutes. Add the lemon zest and pepper flakes as they are cooking. Once soft, add the chopped sweet potatoes and give everything a good stir. Add the water/broth, bring to a boil, then simmer until the potatoes are soft. 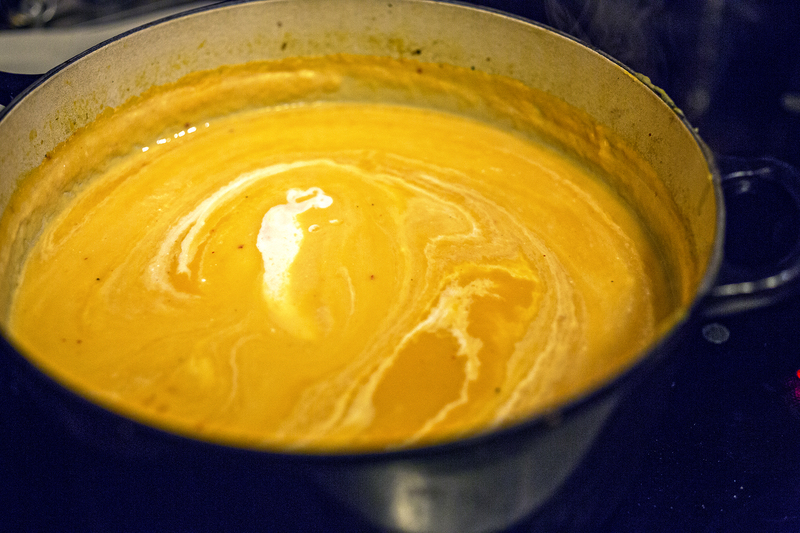 Using an immersion blender (or working carefully in batches with a regular blender), purée the soup. Put back in the pot over low heat (if you used a regular blender) and add the lemon juice, coconut milk and more salt and pepper to taste. Serve warm, room temperature or cold. Blending local and international flavors with indigenous meats. Yep, that’s what we do. And the occasional cocktail.